Michigan State track &amp; field captured was dominate on both the field and the track Saturday on the final day of the Auto-Owners Spartan Invitational at Ralph Young Field on Saturday. Under nearly perfect conditions, several personal bests were set. EAST LANSING, Mich. — Michigan State track & field captured was dominate on both the field and the track Saturday on the final day of the Auto-Owners Spartan Invitational at Ralph Young Field on Saturday. Under nearly perfect conditions, several personal bests were set. Senior Asya Reynolds started the day with a win in the high jump. On her first attempt, she won the title with a leap of 1.69m (5-6 1/2), which was just shy of her personal best of 1.71m. 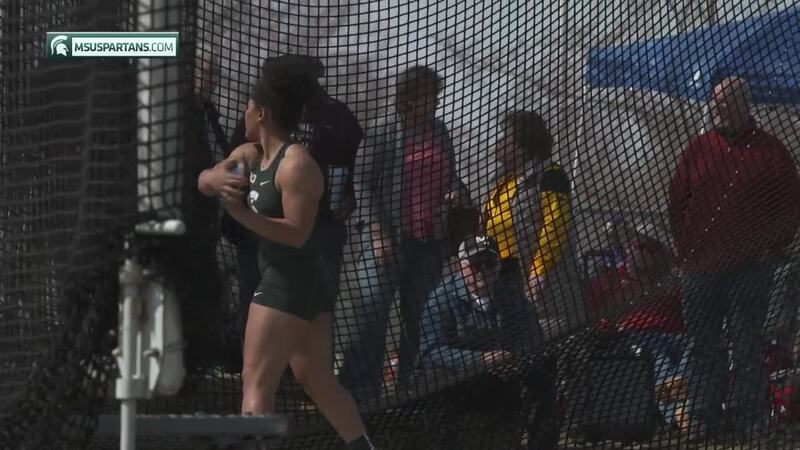 Michigan State finished 1-2-3 in the women’s discus led by sophomore Kayli Johnson a person-best throw of 48.95m (160-7). Sophomores Nikole Sargent (45.46m/149-2) and Rebecca Mammel (42.05m/137-11) finished second and third, respectively. Johnson also won the shot put (15.50m/50-10 1/4). On the men’s side, sophomore Jerimiah Evans took the title in the men’s shot put with a winning throw of 18.33m (60-1 3/4) setting a new personal best. His previous best was 17.12m at the Spartan Invitational last season. Evans was second overall and first among collegiate performers in the discus with a throw of 58.76m (192-9). “I thought that the biggest bright spots were Sophia (Franklin) yesterday and Jerimiah (Evans) today. He threw over 18 meters in the shot and came back with a really big throw in the discus. He will make a lot of jumps between now and the end and that is a sign of someone who is going to score big points at the conference meet,” Drenth added. All-American Nick Guerrant was busy all day with the long jump, the men’s 4x400 relay and 110 hurdles, as he continues preparation for the decathlon. Guerrant won the long jump with a leap of 7.32m (24-0 1/4), which was an outdoor personal best. Senior Jon Edwards was third in long jump (6.92m/22-8 1/2). Freshman Olivia Lopez won the women’s long jump with a season-best 5.58m (18-3 3/4). The track events got started with a pair of wins on the relays. In the women’s 4x100, the team of sophomore Brooke Bogan, sophomore Drew Coleman, senior Taylor Mullins and senior Denise Spann took first with a time of 46.22. This was the first time Michigan State has run the 4x100 relay this season. In the men’s 4x100 relay, senior Will Agodu, freshman Peirre Brown, freshman Joe Stevens and junior Savalas Morgan battled to victory with a time of 41.74.Spann also took home the title in the women’s 400m with at time of 56.67. Agodu earned his second win of the day in the 110 hurdles with a season-best time of 14.28. Michigan State took four of the top five spots in the 110 hurdles with Morgan finishing third with a time of 14.70m, while senior Devin McKinney (14.90) and junior Nick Guerrant (14.96) were fourth and fifth, respectively. The Spartans continue outdoor action April 12-13 at the Louisville Invitational in Louisville, Kentucky.